I have spent quite some time researching and have finally decided on a program that I feels fits me best and will challenge me. I have documented the 10k for Pink running plan from Week 4 – 14. 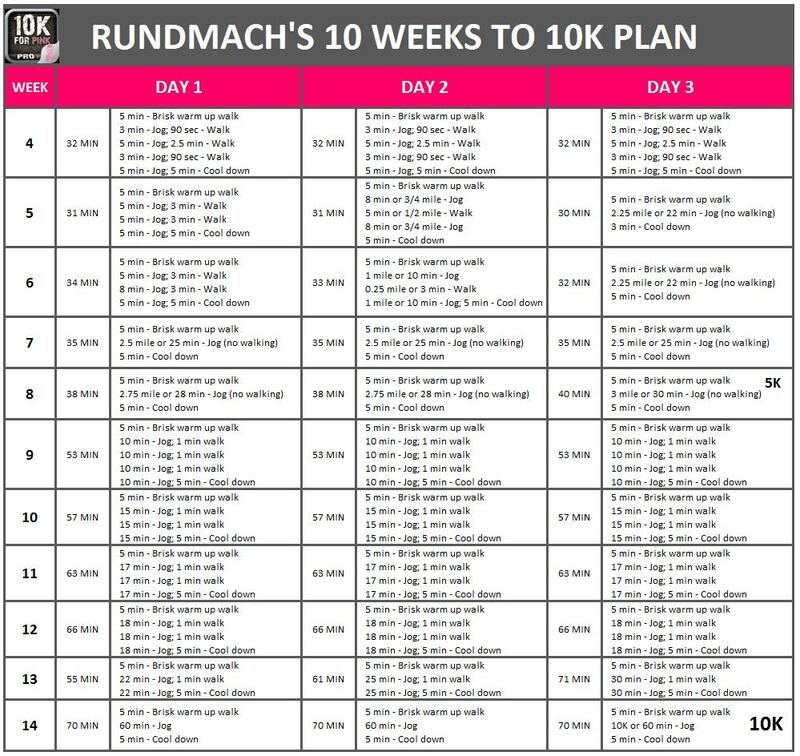 This is the plan I will be sticking by in hopes it gets me to 10k in 10 week! See below for the running plan. 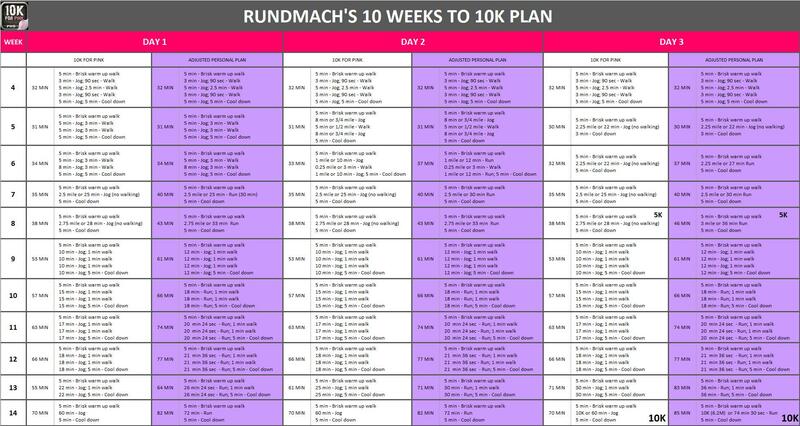 I have also researched quite a few and here are some other 10k Running Plans for beginners. ← Click the image to download the APP for free from iTunes or visit Exercise for Pink to find out more about their other running and work out APPs. Exercise for Pink also offers a Couch to 5K for all of those beginners out there! Click on the picture below to enlarge it and view each run detail from the APP. After running with the 10k for Pink APP, I have had to make some adjustments. I’ve discovered that the APP aims to get you to run a 10 minute mile (10 mph or 6.13 km per hour). 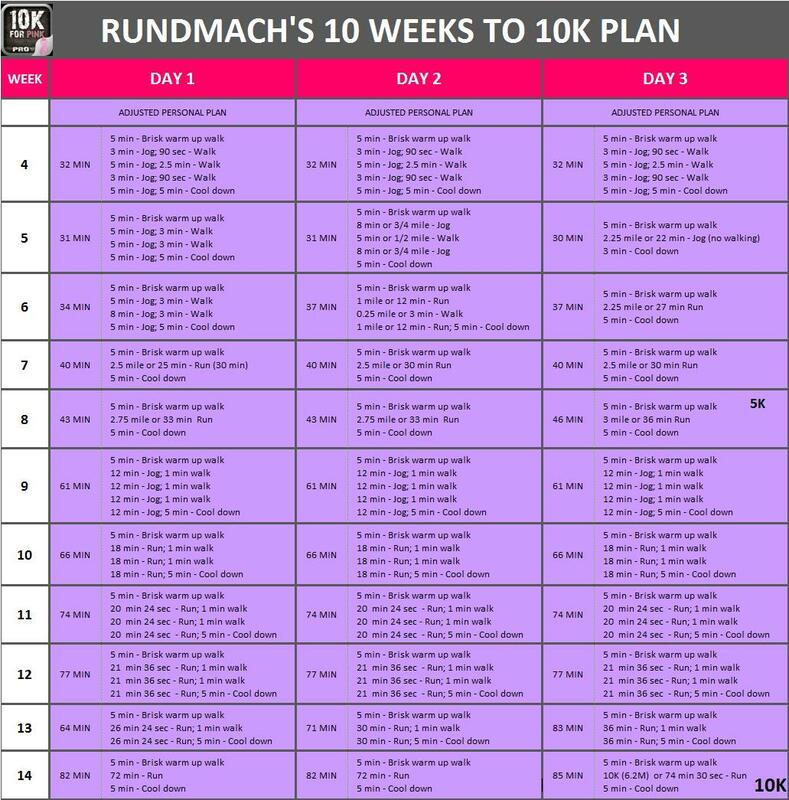 Since I am still a beginner and I’m sure you may be too, I’ve adjusted the 10k for Pink plan to a bit of an easier pace. A 12 minute mile (12 mph or 7:27 km per hour) is still fairly challenging but definitely doable. Below is the new plan; CLICK HERE to see the comparison of the two. If you plan on using this plan below, let me know, I would recommend making some adjustments in week 5 and 6 as well that I didn’t make in my actual runs so I have kept the Plan as to exactly what I did run. Okay, so I fell off of this plan but it doesn’t mean it won’t work. I jumped right out of week 11 and into a 10k run. I was getting too antsy. This is because I didn’t follow each week by week. I took too many rest days between runs. I think this is a great app and great program for beginners. where can i find the first 3 weeks? Hi Megan, I never did the first 3 weeks. If you’d like me to document it from the app I can? The App is free, but if you can’t download it, let me know! Wow I like this seems very organized.